Shanghai, literally meaning “by the sea,” is the epitome of today’s China: modern, dynamic, pristine, futuristic, with a palpable energy driving it forward into the global realm of international trade and finance. Dizzying high-rises in their thousands encircled with swirling flyovers, and an eclectic variety of restaurants, bars and shops make it what every cosmopolitan city today strives to be—sophisticated, suave, and avant garde. The city is, simultaneously, a museum of European antiquities and a showcase of innovative architecture. The biggest metropolis in the country, with a population of 17 million and a 25 percent share of its FDI, Shanghai is befittingly to be the venue for the World Expo in 2010. 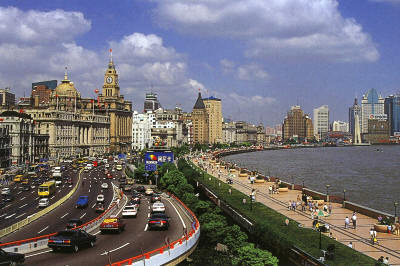 The town of Shanghai used to earn its living by silk and cotton production in earlier centuries. In 1842, after the Treaty of Nanking which ended the first Opium War, the British established the first concession. They were followed by the French, Americans and Japanese, all taking a slice of the city, dividing it into settlements with their own jurisdictions. The financiers, who effectively colonised Shanghai built a metropolis in their own image. The inflow of money was accompanied with the large western commerce and banking corporates venturing in. Shanghai quickly emerged as China’s greatest port. By the early-20th Century, the city had added an industrial base to complement its trading success. This growth was, however, attended with a stifling inequality in its peoples, giving birth to the Chinese Communist Party in 1921, who eventually liberated the city in 1949. Lying on the west bank of the Huang Pu river, a tributary of the Yangtze, the Bund, an Anglo-Indian term for embankment, spans a length of 4 kilometres. Nearly 52 buildings of varying European architectural styles dating back to the late-19th and early-20th Century line the Bund. 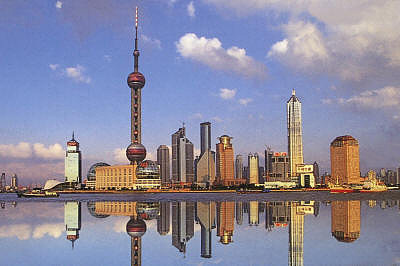 It is a proud chapter of Shanghai’s history; the focus of its past financial and trading triumphs. I took a leisurely walk along the Bund at night, immersed in the unique history and character of the location—a symphony of antiquated buildings, bathed in gold and white light, faced Victorian lamps standing sentinel over streams of people walking by, all equally enchanted as myself. Notable landmarks include the Peace Hotel, built in 1926, the Customs House dating back to 1927 and the ornate former headquarters of the Hong Kong and Shanghai Bank opened in 1923. Pudong across the river is the complete antithesis to the Bund. Glinting with confidence and poise, it is the very symbol of China’s ambitious and zealous reform drive over the past years. A mere decade ago Pudong had been covered with rice fields. Today, the Pudong New Area, larger than Shanghai itself, is a huge economic zone and the contender for the world’s tallest building once the 94-storey needle shaped World Financial Centre is completed before the 2008 Olympics. The crystalline Jin Mao Dasha [Golden Prosperity Tower] searing 1,379 feet high into the clouds is China’s tallest and the world’s third tallest building. Built by an American architect in 1999, it is the perch of the Grand Hyatt Shanghai, the world’s highest hotel. A high speed lift rockets visitors to the observation platform on the 88th floor in a paltry 50 seconds. The unusual and imposing Oriental Pearl TV Tower nearby resembles a 1950s monument to the atomic age. Both buildings are located in Lujiazui, the financial district of Pudong which houses head offices of over 50 banks, both national and international. I loved Shanghai! As much as Xi’an. Which could be deemed as contradictory since they are both poles apart. One ancient and chaotic. The other pristine and progressive. All I knew was that if I had been Chinese, I would have been a Shanghainese. China is incredibly organised and disciplined during the day. At night it ruptures and bursts alive like some mammoth firework in the night sky. I doubt anybody ever sleeps here. I went clubbing on my first night in town, after having taken a ferry across the sparkling river and gone up to the 88th floor of the Jin Mao Dasha to stand on top of the world, amidst the silver clouds. During this venture, I visited open airy cafes in packed squares with movies running on gigantic facades of large concrete buildings, and dark smoky pubs with dubious pictures on the walls and drinks that cost both the sky and earth. To learn life, one must attend each lesson at least once. Next time I go clubbing, I promise myself I will get drunk. For this first, I was too bemused, taking in the bored men, loud women, and skimpily dressed cabaret dancers crooning American songs to an audience that didn’t understand a word of English at all. The Edward VII road slicing through Shanghai has an interesting piece of vocabulary associated with it. Dating back to the mid-19th Century, it used to be a stream called Pigeon Creek and was flanked by the British settlement on one bank and the French quarter on the other. Those immigrants that crossed over would, thus, speak scanty English or French in the foreign settlement, giving rise to the simile of speaking pigeon English or pigeon French. In the north-west part of Shanghai is the city’s most devout spot, the saffron-coloured Jade Buddha temple. Its centrepiece is a jewel encrusted white jade Buddha in a small wooden building upstairs. The effigy stands over 6 feet tall and was brought from Myanmar [Burma] in 1882. With its glowing sheen and captivating calm features, it is clearly south-east Asian in style. Downstairs in the Reclining Buddha Hall is a pliant Buddha on a couch, representing Buddha giving his last sermon to his disciples before entering nirvana. Sprangled with red and yellow lamps and the fragrance of countless incense sticks, the temple is a charming interlude from the city’s concrete high-rises and flyovers. A trip to Shanghai would be incomplete without attending the world-renowned Shanghai acrobatic performance at the Shanghai Opera House. Chinese acrobatics date back to the Tang dynasty (618-907 AD) when they were a major form of entertainment in the upper strata of social circles. An amalgam of various art forms found throughout the Chinese empire at its height, Chinese acrobatics have come down the ages, further embellished and enriched. It is a mind-blowing performance carried out by children and youths supple and lightning quick in their movements, creative in their enactments, sincerely enjoying their own accomplishments. For the veritable shoppers, there is Nanjing Pedestrian Road, the most commercially prosperous road in China, covering just over a kilometre. Along the road are new and old shopping malls which are considered to be one of the world’s busiest commercial areas. Near the Bund, is the old Chinese quarter, reminiscent of historic Shanghai and comprising the Yuyuan Gardens and Yuyuan Bazaar. The Gardens were designed by the Pan clan, a wealthy Ming dynasty (1368-1644 AD) family of officials. Labyrinthine paths wind under rocky outcrops, past pools brimming with goldfish, through caves and stone formations. The modern bazaar, an endless maze of souvenir outlets, is designed on Ming and Qing architectural styles. Lined with lights, it transforms itself into a fairy land at night and is the place to go gift-shopping. Shanghai. No one can quite remain unaffected after visiting it. It changes one’s whole perspective of China. And even of the world. Opening our minds and imaginations of what China is and can do. The immense potential that lies within the country to meet tomorrow, yet staying true to its inherent unique cultural and historical self. 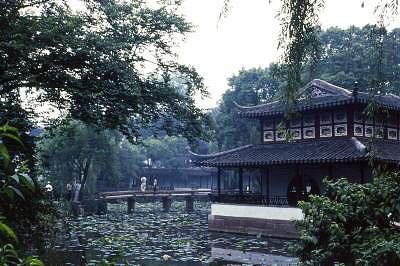 Fifty miles north-west of Shanghai is the ancient garden city of Suzhou. Throughout history, China’s military generals commonly originated from the northern areas, while scholars of Confucianism, Taoism and Buddhism hailed from this city of tranquil beauty. Suzhou’s predominant historical relic is the Grand Canal and its waterways. 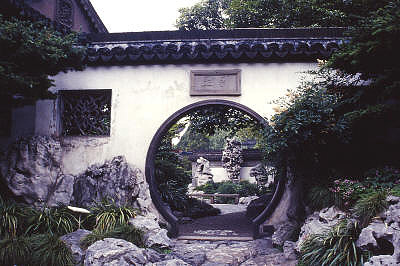 Suzhou’s chief attraction is, however, its many gardens. Chinese gardens aim to inspire a philosophical and meditative mood and are a peaceful arrangement of water, stone, pavilions, bamboo groves, islets, and bridges. Microcosms of nature, they bring elements of mountains and rivers into the city. One of Suzhou’s finest gardens is considered to be the Humble Administrator’s Garden, belonging to a 16th Century high-ranking official, and is the largest garden in the city. Silk embroidery and silk weaving are Suzhou’s impressive cultural accomplishments. Often referred to as embroidery paintings, Chinese embroidery has a long history of over two millennia. The exquisite handiwork and richly coloured silk threads no thicker than 1/10th of a hair’s breadth are further enhanced with a deep subtext of art and culture. It usually takes months, even years to complete a piece of work from beginning to end. Of special significance are the double-sided works which depict images on both sides of the fabric and are created consecutively with two sets of needles and threads. This entry was posted in China, Exploring our World and tagged Bund, Jade Buddha Temple, Nanjing Pedestrian Road, Pudong, Shanghai Museum, Shanghai Opera House, Suzhou Gardens, Things to do in China, Things to see in Shanghai, Yuyuan Gardens by Rama Arya. Bookmark the permalink.